The month of February looks promising indeed. Astrologically, it’s pretty peaceful overall. Communities all over the world that celebrate the Lunar New Year (notably the Chinese community worldwide) will have a blast when 农历新年 begins on 5 February, the New Moon in Aquarius. Also, there are no retrogrades. On 19 February, the pre-shadow of our first Mercury retrograde in March will begin – but that’s as far as it goes. Here’s the TAO of Kelly for Feb 2019! A powerful card to start our reading with, The Magician in the Tarot speaks of empowerment, the mastery of self that you gain when you learn to engage effectively with the world around you. This is a card of alchemy, of getting your act together, of pulling together diverse resources and perspectives to create a solution to the challenges you face. It’s a magical card, and it’s a reminder that in fact, you are the magic. Associated with Mercury, the planetary ruler of communication, technology, and travel, this card portends success in public speaking, presentations, travel (especially work trips), and new projects/endeavours. An exciting, charismatic, highly capable person could also enter your life (if they’re not in your life already) and/or play a role in events. This is someone who will inspire you to give of your best. If they’re your mentor, fantastic. If they’re competition, you’ve got a tough fight on your hands, but it’s all for the good – they’ll bring out hidden potential in you. Be bold and be strong when The Magician appears. This is not a time to indulge your weaknesses. Learn. Grow. Speak up. Assert yourself. The possibilities for self-development are tremendous with The Magician. Part of embodying The Magician in your life this month will require you to discern – and then trust – the still, small voice of wisdom in your soul. Angelic guidance will come for you when you listen to your Higher Self; it could also come in conversations with mentors, family members, and people you trust. Be mindful that this voice of Divine guidance can be very subtle – it’s not always an Archangel blasting a trumpet on Judgement Day. For those of you who struggle with low self-esteem and a powerful inner critic, this card calls upon you to heal the deep wounds that energise those critical voices, in order that you may truly connect with the voice of Higher wisdom. Lots of teachers in the New Age movement and in esoteric Spirituality like to talk about listening to your intuition, and all that is true and wise and wonderful – but only if you are healed, whole, and stable in yourself. People who live deceitful/unethical lives, who have major trust/control issues, or who struggle with emotional/psychological problems – your source of clairaudient wisdom is likely to come from a counsellor or therapist. Get professional help. What a wonderful card to get! 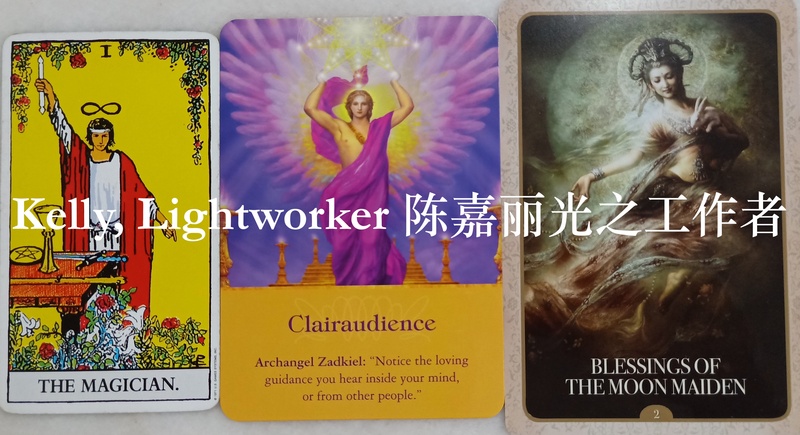 When The Moon Maiden appears, auspicious tidings of love, prosperity, abundance, healing, breakthrough, and every blessing are coming to you now. You are asked to open up to what you believe is possible, and to welcome good fortune to come to you in whichever forms it chooses to take. Do not hold back your blessing with self-limiting beliefs or fear-based mindsets. Your time is now! To optimise the blessing that will enter your life, adopt an attitude of thankfulness for what you have now, and cultivate a trusting heart towards what you will receive soon. As much as possible, pay this forward by being generous and compassionate towards others. Have faith that good things are surely coming for you. When The Moon Maiden turns up in a reading, the sky’s the limit. Have a great February 2019!